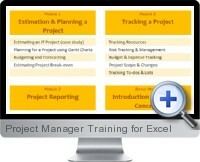 Project Manager Training for Excel is a comprehensive online course aimed at project managers to leverage the functionality of Excel for project planning and management tasks. The project manager training is self paced and requires a working knowledge of Excel to be applied to the targeted subject matter. The training includes example Excel workbooks and high definition videos covering the the most pertinent aspects of project management and the application of Excel solutions to both project specific and financial analysis components. The training course spans 2 months allowing to complete without impacting professional obligations. Project Planning and Estimation - Case study for estimating a project, project planning using Gantt charts, project budgeting and forecasting and breakeven analysis. Project Tracking - Tracking resources, risk analysis and management, budget and expense tracking, project scope and change analysis and monitoring task lists. Project Reporting - Commercial analysis of a project, scope burn down, milestones, status dashboard reporting and earned value management. Financial Concepts - Profit and loss, balance sheet and cash flows, estimating project costs, advanced project risk analysis and Monte Carlo simulations.